As a child Nick learned to fend for himself in the unforgiving and often cruel wilderness of Cody, Wyoming. Fearing their son might forever run with the wolves Nick’s family decided to move to the booming metropolis of Laramie, WY where Nick soon learned the way of the streets. 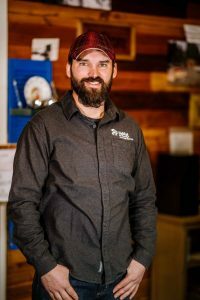 Hardened by his experiences and longing for the sense of adventure Nick moved to Alaska where he was able to complete his college education and learn the carpentry skills necessary for a career in carpentry. As a construction lead Nicks favorite part of his job is the opportunity to teach others construction techniques and be a part of a good cause. Nick enjoys all things outdoors and has a passion for any builder project, large or small.